The Nobby Cat Tree Manga is an incredibly unique cat tree from world leaders of cat tree craftsmen, Nobby. This luxurious, magical and inspiring cat tree will provide the perfect environment for your kitty to take themselves off on their own little magical adventure. Not only this, but wherever you place this within your home it will be sure to catch the attention of anyone around it. The clean lines and the smooth curves of the Nobby Cat Tree Manga will make even the most ferocious felines start crying with joy at the sheer awesomeness of the Nobby Cat Tree Manga. 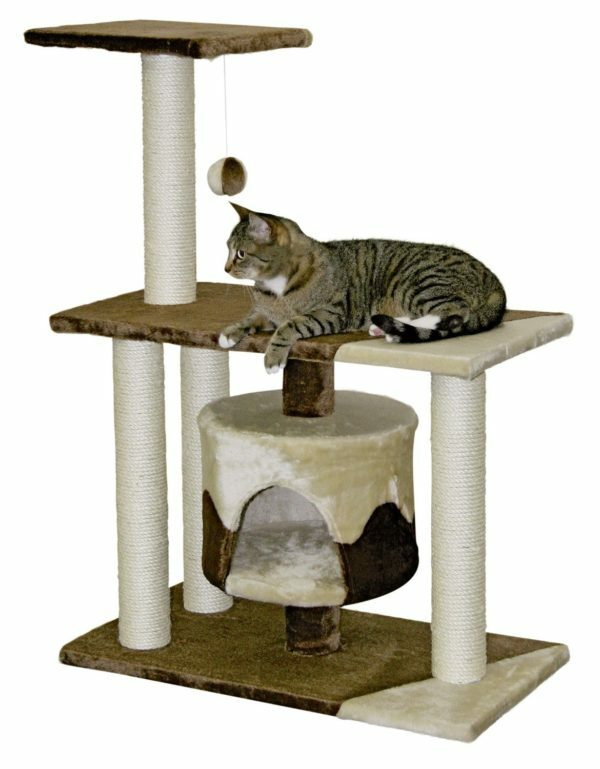 This cat tree has several levels and platforms whereby your feline friend can climb, jump, and explore. Everything has been beautifully connected together with winding sisal poles that provides the puurfect place for your feline friend to have a good old-fashioned scratching session. Neatly nestled in the centre of this cool kitty construction is a lovely private kitty house that provides a luscious sanctuary for your feline friend to have a catnap in safety and security and also privacy 🙂 This is a fantastic all-rounder that will be able to handle multiple felines all at the same time as well.